I read this article and found it very interesting, thought it might be something for you. The article is called How To Get India’s Women Working? First, Let Them Out Of The House and is located at https://archive.indiaspend.com/cover-story/how-to-get-indias-women-working-first-let-them-out-of-the-house-74364. India boasts superior rates of women serving in political office compared to other emerging economies: the nation just swore in its 16th female Chief Minister, Mehbooba Mufti. Yet it lags well behind its competitors in its rate of women’s labour force participation. There is surprisingly little data to answer why. But one reason stands out: women can’t get to work. India is well beyond the point when economists would expect that high numbers of women would begin participating in the labour force. Instead, 25 million women have left the Indian labour force over the past 10 years. Today, only 27% of Indian women are in the labour force, the second-lowest rate of female labour-force participation in South Asia after Pakistan. And while that country’s female labour-force participation is rising, India’s is falling. Limited mobility is one of the key challenges many women confront when they set out to find a job. India’s road network now spans more than 4.69 million km, a 39% increase over 10 years earlier. Between 2007 to 2011 alone, an additional 600,074 km were laid. The rate of car ownership is also rising, with more than 2 million cars sold last year in India, up 9.8% over 2014. Public transportation systems are expanding, too. But these infrastructure improvements are not translating into substantive gains in women’s mobility and ability to get work. And when women do work outside the home, on average, they do not travel as far to work as men. In short: the further from home the opportunity, the less likely women are to access it. Our research at Evidence for Policy Design indicates that India’s women want to participate in the labour force at higher rates. But they are constrained by lack of skills, and by social norms restricting their mobility. Women who work outside of agriculture are typically engaged in informal, home-based work activities. This is not necessarily reflective of their preferences—it also points at structural factors that keep women from pursuing employment outside the home. National Sample Survey data highlight that disparity, and a pilot survey we conducted of rural youth in Bhopal and Sehore backs it up: 91% of below poverty line, female respondents (aged 18-25) think women should go out of the house to work–yet nearly 70% of these women were unemployed in the previous year. Within India, cultural attitudes about whether it is proper for women to leave the home by their own decision, and whether they need to be accompanied on these trips, vary by region. Using two rounds of the Indian Human Development Survey (IHDS), we found that 79.9% of women reported not being allowed to visit the health centre without permission from their husbands or other family members. In 2012, 33% were not allowed to go alone to seek medical care, a marginal improvement over 2005 (35%). Nationally, the IHDS survey also shows that 51.7% of women think it is usual in the community for a husband to beat his wife if she leaves the home without telling him. Even when a woman does have the freedom to leave the home, distance is still a pertinent constraint. In a sample of Skill India participants, 62% of unemployed women reported that they were willing to migrate for work, but 70% said they would feel unsafe working away from home. The implications of a rapidly industrialising and urbanising India for rural women with restricted mobility are concerning. Projections indicate that most of India’s economic growth in the next 15 years will be generated in urban areas: In 2010, the McKinsey Global Institute estimated that India’s cities could produce 70% of Indian GDP and 70% of net new jobs created up to 2030, and stimulate a near four-fold increase in per capita incomes. 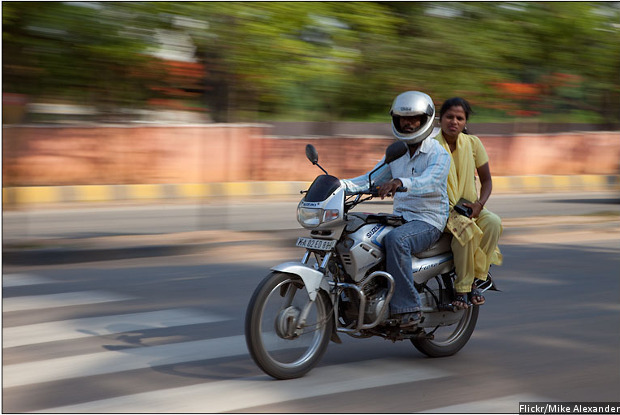 As it stands, mobility statistics suggest that women outside of India’s major population centres face exclusion from the coming urban boom. Women’s desire for productive work is not simply rhetorical. There are places in the Indian economy where women are well-represented in the labour force, but these tend to be fields where women can work close to home. Public works projects created under the Mahatma Gandhi National Rural Employment Guarantee Act (MGNREGA) have been quite successful in drawing women into the workforce. While only 27% of rural women work outside the home, MGNREGA’s participants were 51% female in 2014. Several factors make MGNREGA attractive to women, including its 30% quota for women participants. By accident rather than by design, MGNREGA largely eliminates mobility constraints by being structured around thousands of community-based project sites. In addition to localising project sites close to where rural women live, MGNREGA also provides equal pay for equal work to both male and female labourers. Finally: MGNREGA projects are low-skilled work, and thus accessible to women without experience. As we discussed in our December IndiaSpend feature, many women—especially rural women—express concern that they lack the skills necessary for the jobs they would like to have. The government of India has recently prioritised drawing huge numbers of India’s youth into the labour force and cities through Skill India and Make in India. Both programs include quotas to ensure a certain proportion of trainees are women. These schemes present an unprecedented opportunity to bring many young women into the labour force, but they often require that women leave their home communities to pursue work placements after training, and there are currently no mechanisms in place to support women migrants once they have been placed. MGNREGA may be the first step to letting women out of the house. Skill India’s challenge will be to help women be successful further afield, where greater economic and other opportunities may lie. Women’s education levels are rising, as is women’s financial inclusion. But women’s labour force participation is in decline–and our data shows that women’s mobility may be declining as well. This must be addressed, if India’s women are to have access to the same economic opportunities as their brothers. Indiaspend another informative and useful article must read. There are other important reasons why women are unable to ‘work’ easily in urban or rural India. For the lower income households (which means most of us), a woman’s work at home is indispensable. If she has to or wants to work outside, then it must be in addition to household chores. It would seem that for more women to be able to work, there is first a requirement to ease her household work burden. This can be done if the men in the family are willing to share work and responsibilities, like looking after children and helping with cooking and so forth. Also, the boys need to contribute to household work as much as girls, at least. In one study it emerged that rural women were able to take up many days more of daily waged work in and around their villages, if they had an LPG connection instead of having to cook in the traditional inefficient way and not have to spend hours everyday fetching firewood and fodder from the forest. Family support is critical for enabling women to work in regular, more formal jobs. Decades ago, women belonging only to the bottom rung of economic rung of the society used to work. Women of the middle and upper class were staying at home for it was an honor issue for the parents. They were married early. Women in colleges were a rarity. Slowly, they started going to colleges because it increased their value in marriage market. Now, single and married girls both in the low and middle class families are socially accepted, though grudgingly. If women are getting out of the work force, it means that the earning power of the male species is increased to the extent that the families don’t need for ladies go to work. A good sign on the economic front. Yes, true, women are still dependent on men. Unless men morally support at work and in personal life, it is still a struggle for women because many still feel that ‘Wine, Women, Wealth, Work and Whatsapp’ is still a man`s world. Hope the situation gets better as the time goes on. Men should give up their ego & motivate women and travel together.